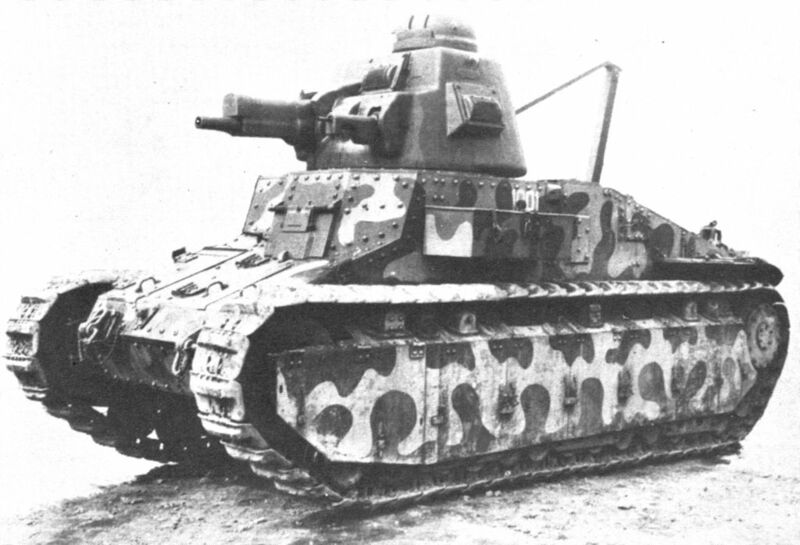 The history of the “D” series of tanks, built by Renault in the period between 1926 and 1932, began almost immediately after the First World War. The combat success of the FT, which is recognized as the best fighting machine of the war, was marred by numerous technical problems, which meant that about 20% of the light tanks could not be combat-ready. Also, from the military point of view, there were complaints about the weak armor, low speed and serious chassis limitations for upgrades and handling. On the other hand, the single 37 mm (1.46 in) gun or 7.5 mm (0.295 in) machine gun mounted on the FT perfectly suited General Jean-Baptiste Eugene Estienne’s original concept. Thus, it was concluded that the French army needed a new infantry support model, with the same armament, but higher mobility and protection, ending with a 1922 official specification. In 1923, Renault was issued an order for two NC prototypes, featuring an improved suspension and a more powerful engine. However, the Renault Modele M24\25 (NC2) still strongly resembled the FT. The main difference was a new Kegresse type suspension and rubber tracks. In December 1925, M24\25 trials revealed a top speed of 18.5 km/h (11.5 mph), which suited even the cavalry requirements of 1924. At the same time, the NC1 found its mark on the export market, designated as the NC27. The French army was still not happy with them, as they had extremely low chassis reliability and were deemed too complex. Seeing that a simple overhaul of the old FT led to a dead end, Renault’s engineers turned their attention to a radical revision. 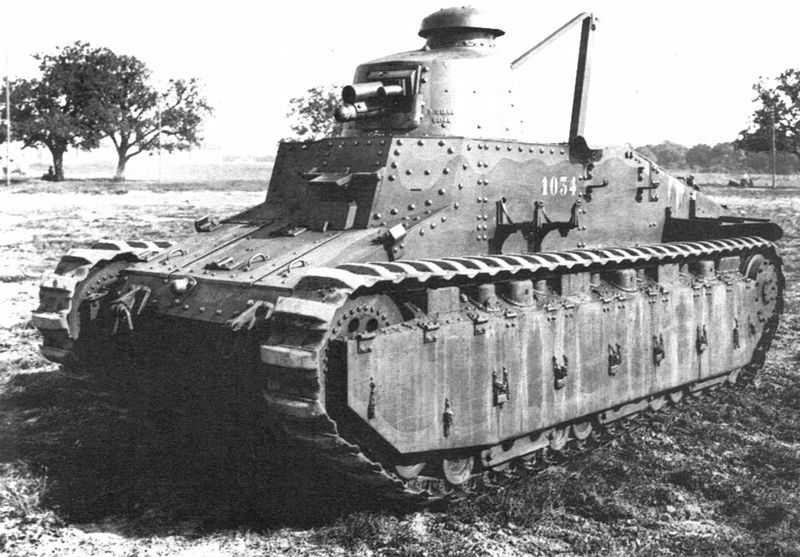 In 1928, Louis Renault received an order for two prototypes of the NC28, which were aimed at the army program Char D. The chosen basis was the NC1 (M26\27), although this modified version was also called NC2 (second), sometimes confusing historians. The second prototype was designated NC3. In March 1929, after a comparative test, the Army choose the NC3 and, in December, placed an order for 10 pre-production tanks, changing their designation to the NC31 (for 1931, the expected date of delivery). In contrast to the former NC1, these new models were roomier, with a new ST1 turret designed by Schneider, but at a unit cost of 400,000 francs. In May 1930, Renault had received an order for the next two prototypes, one of which (Char D2) was a further development of the NC31, and the second (Char D3) intended for the colonies, while the production tanks were still designated “Char D1”. The Army requirements for the NC31 based D1 included a more reliable 6-speed manual transmission, a new 74 hp 6.08 L Renault engine, a relocated exhaust pipe, an improved cooling system, redesigned idlers and increased fuel capacity to 165 liters. The hull construction called for riveted rolled armor plates. The armor thickness varied, from the front and sides of 30 mm (1.17 in), to 16 mm (0.63 in) on the rear and lower parts, and only 10 mm (0.39 in) for the roof and bottom. The side skirts protecting the suspension were 10 mm (0.39 in) thick. Due to its small size the stern was equipped with a steering tail, increasing the length to 5.76 m (18.9 ft) and the weight to 11 tons, making it a medium type. The crew was now 3, but the general interior layout remained similar to the previous FT and NC. The driver sat on the left, also manning a fixed Reibel light machine gun. On the right a radio operator took place, manning an ER52 or ER53 with a huge and characteristic twin-boom antenna. Because of this unusual feature, the tower had a reduced traverse of approximately 345°. As the conception of Schneider ST1 turret dragged on, the first D1s were equipped with the 37 mm (1.46 in) cannon SA18 and FT turret. The improved ST3 was characterized by the presence of rectangular niches and was roomier for the tank commander. However, the military commission rejected these new 3 ton models, and only one was ever fitted, for training purposes. In the end, a compromise design was chosen, the ST2, which featured increased dimensions (1.7 tons) and a more complex, three-tiered arrangement shape, with a commander observation dome on top. It was equipped with the new 47 mm (1.85 in) SA34 gun and a 7.5 mm (0.295 in) Reibel coaxial machine gun. The wheeltrain comprised 12 road wheels on each side interlocked in three bogies with a block spring suspension and 2 independent wheels for extra tension with gyropneumatic shock absorbers, four return rollers, a front guide and rear drive sprocket. Tests showed a top speed of 18.5 km\h (11.5 mph), but a range of only 90 km (56 mi). It could handle a 40% slope, climb a 110 cm (43 in) wall, ford to a depth of 90 cm (35 in) and cross 2.2 meters (7.22 ft) wide trenches. The D1 formed the basis of medium tanks until 1936, until the appearance of the lighter Hotchkiss H35, Renault R35 and the SOMUA S35, incomparably better. The pre-series NC31s were kept for driver training and the first production vehicles were sent to the 507e, 508e and 510e RCC elite tank battalions. However, these were equipped with provisional FT turrets. By March 1934, 110 tanks had been delivered, but 17 of them were found completely worn out and were returned to the builder for overhaul, and the remaining 63 were barely combat ready because of numerous defects and breakdowns. Armored plates were bent because of poor quality material and assembly, and the turret proved unpractical and uncomfortable at best. Plus, the 47 mm (1.85 in), derived from a 1897 naval gun, proved to have a too low muzzle velocity for effective use as an AT gun. Proposals to change this model for the new SA35 were dropped because of the cramped turret. However, to avoid incoming political scandal, the firm took several steps to upgrade the D1, which remained unsuccessful. Needless to say, the Army was not satisfied with this model and tried to get rid of them. They decided in 1936-1937 to send the whole lot into the colonies. In Tunisia the 61e, 65e and 67e BCC (tank battalions) had the duty of preventing the landing of Italian troops. Each battalion comprised 45 tanks and one radio version and 14 were kept in reserve for spare parts. 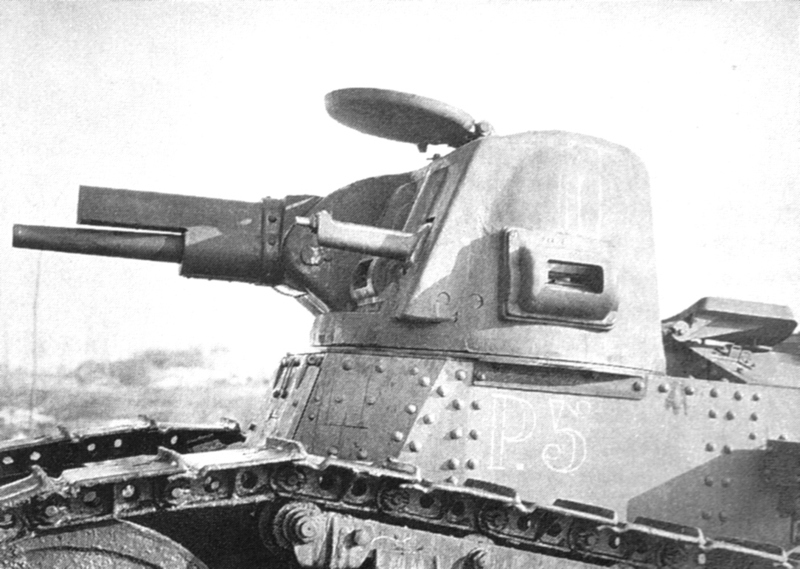 Some hopes to sell the tank to the Belgian government in 1932 were dismissed due to the fear of dispensing valuable “technological secrets”, and the latter turned to Vickers instead, to their advantage. Surprisingly, the hopeless situation of May 1940 led to decision to repatriate as many existing D1s possible, to participate in the so-called “Weygand Plan”, defending localized strongpoints called “hedgehogs”. By then, in early June, the French General head of Staff found, after an audit in Tunisia, that only 43 D1s were battle-ready, They were shipped and gathered into the 67e BCC, which went to defend the Souain pocket, in support to the 6th Senegalese Infantry Division. On, June 12, the battalion clashed for the first time with the 9th Panzer Division. They managed to knock out four German tanks, but later they failed to break through the enemy’s defenses. Using flanking attacks with their 37 mm (1.46 in) guns, the Germans managed to destroy seven tanks, and the rest had to be withdrawn, following the retreat of the Senegalese division in the south. During the night of 12-13 June the battalion was ambushed and lost many of its D1s. The remaining 18, later captured by the Wehrmacht, received the designation Panzerkampfwagen 732(f), but their fate is unknown. After the terms of the capitulation act, the French were allowed to retain part of the armored forces. Among these, the remaining D1s were in poor condition. Not knowing about the future plans of the government of General Petain, the French colonial authorities decided to conceal 18 tanks, presenting the Italian Inspection Commission only 82 of the original 106 D1s. They were distributed between the 2nd and 4rd Chasseurs d’Afrique, with 20 and 40 D1s respectively. Two tanks were kept for training. By November 1942 the Allies invaded North Africa. Although the D1s were not engaged in combat, in the winter of 1943, the Allied command transferred the most capable machines into the Brigade Legere Mecanique (light mechanized brigade), without antennas. In February, some of these D1s were involved in heavy fighting at Kasserine Pass, even managing to knock out one Panzer IV. But since their continual use, these D1s accumulated problems and in March they were replaced by British Valentines. Decommissioned, these survivors were sold for scrap. 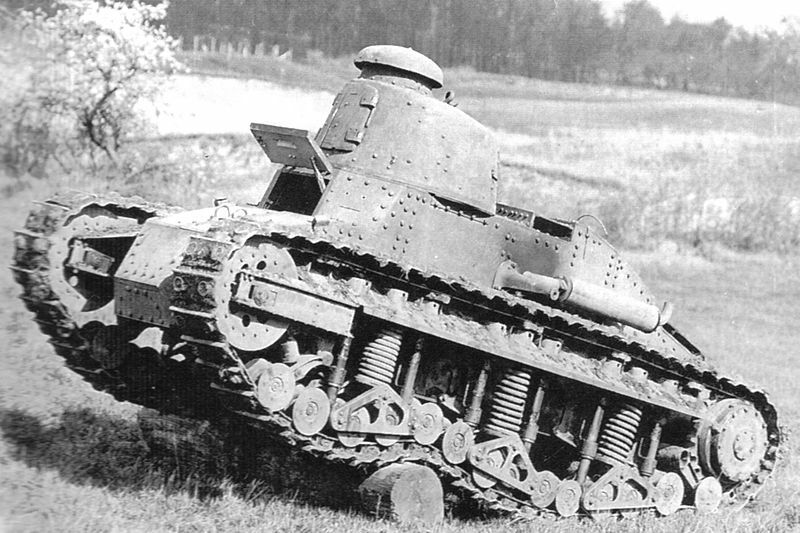 Renault NC28/NC2 in 1930, with the FT turret, test prototype without side skirts, showing the complicated suspension. D1 pre-series in 1934, still using the provisional FT turret. These machines were later kept for training. Tank #1032 during the tests of the Bernard tank transporter. Probably a unique early camouflage for trials in 1936. This particular livery was unveiled by P.Danjou for Minitracks. A D1 during maneuvers at Camp de Sissonne in June 1936. This pattern is featured in the last photo on this column. Char D1 with the regular “horizontal” pattern of 1937-38, Oran, Tunisia, 37 BCC, September 1939. Renault D1 during the battle of France, 67 BCC, Souain sector, June 1940. D1 of the French Free Forces in Tunisia, late 1942. These vehicles were striped of their antennae, and fought against Axis forces in eastern Tunisia, notably at the battle of Kasserine Pass. Stridsvagn FM28 Renault NC 27 in Swedish service. It was a source of inspiration for the Renault D1 development.